First I wanted to point out that I had the great, great chance to talk with Michael 20 years ago around the same time at the Fangoria's Weekend of Horrors . It was another great chance to get to talk with him, he is one of the nicest people you could meet, he respect for us as fans as we respect him for giving such great rolls over the years. So I want to thank Michael, Days of the Dead and Judy for making this happen... lightening does strike twice. -With such an amazing career as you have had from a familiar face to screen icon... what do you find to be your powerful, favorite and memorable roles? Michael Berryman: I consider a powerful role to have a depth to the humanity of the character. Playing 'Ellis' in Cuckoo's Nest was my first real role of such breadth. The moments on camera were few but effective. I give thanks to Milos (Forman) for having the 'eye' for capturing an 'essence' on camera. He directed me in a very inward manner. I mean by this, that he really made clear what the lens had to discover. The pay-off moment was when 'Ellis' smiled at the party. It was a revealing, from deep down, inside the soul of (Ellis) a once strong and expressive man, who was lobotomized to curtail his actions and what he needed to express to the group (the men on the ward). My all-time favorite screen moment is my portrayal of 'Owen Jarvis' in the X-Files. Now that role was a full circle. At first the audience is led to believe that Owen is perhaps a creepy guy with ill-intentions toward Dennis (the young boy) whom, Owen sacrifices himself to protect. Meeting with Chris Carter and David Nutter was exciting and I felt a vibe in the room, when we met, that was relaxing and full of invitation for artistic expression. I knew that my 'looks' can get me in the door for interviews but I pride myself in fulfilling my responsibility as an actor. Working with David (Ducovany) and Gillian (Anderson) was a treat. They were super professional and I really felt supported in our scenes. -Were you happy with the outcome of the "Days of the Dead" convention, is there anyone you were happy to see/meet of a celebrity nature? 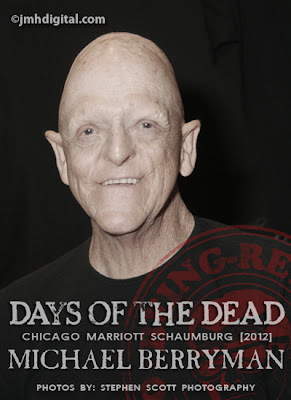 Michael Berryman: 'Days of the Dead' was fun. The fans make a show worth it! Also, having time with my actor friends is a warm and happy time. It's like a family re-union. But I go for the fans #1. -Working with Rob Zombie in recent years, do you find he is also very respectful to your contributions to film/television work and what was the process to getting the roles? Michael Berryman: Rob (Zombie) is a friend and he loves to work with actors that have impressed him in films. He is gracious and tells you what he needs, but he has a certain spark in his eyes, because he knows that he can depend on you to bring something fresh and spontaneous to a scene. I love him for that. He just calls Judy (Fox) my manager and we say 'When do you need us?' That's really cool! -Do you find yourself falling into one typecasting of the horror world, does that bother you and what are some of your upcoming rolls? Michael Berryman: I get a wide range of roles and the arc has expanded more and more. I don't worry about type-casting. Trust me, everyone gets 'typed'. Recently, I wrapped up 'Army of the Damned' in Rhode Island. A Chad Verdi Production, directed by Tommy Denucci. Of course, I love 'Below Zero'. The role of Gunner was a very proud role for me. Look for 'Hell's Kitty #10' on you tube...also 'Watch what you ask for' by Suze Lanier-Bramlett...a music video. Upcoming a short called 'Super Zero' by Landon Williams...it is in post but soon to be out. Check out his site.. Primitive Mind Productions. Michael Berryman: So, there you have it! Much more to come, thank you all for supporting my efforts in this wonderful arena of 'Storytelling'. Now go out and make the world a little better place, today. Peace. Even now, he still keeps really busy. He was great in that role on the X-Files. And great way to wrap up with the Motley Crew video and the famous ear wiggle.